In September 2004, the conscience of the entire world was deeply disturbed by what is remembered as the Beslan massacre, in Russia. In the wake of the enormous emotion aroused by this tragedy, the municipal administration of Jesolo decided to donate part of the proceedings of the Sand Nativity to help the surviving children. Sixty thousand euros were finally donated for the reconstruction of the school. 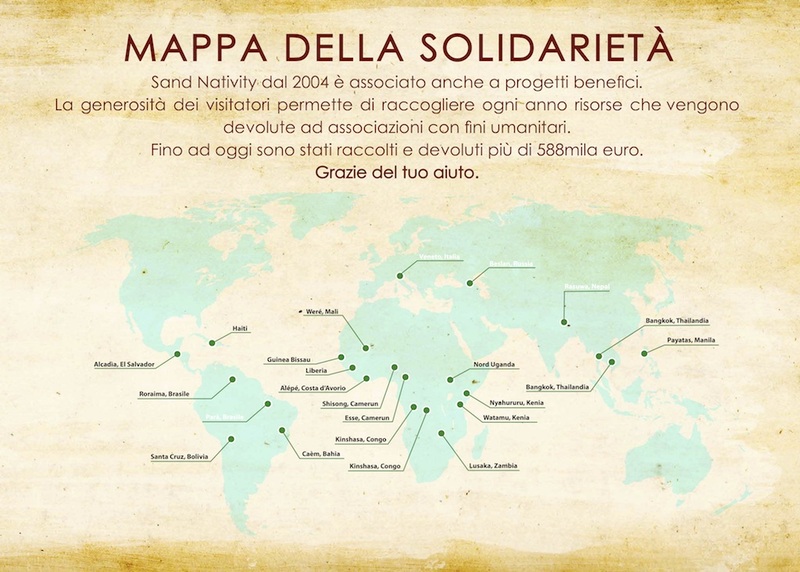 Since then, every edition of the Jesolo Sand Nativity has been associated with one or more initiatives to help alleviate suffering and give hope to the less fortunate: to date, more than 24 projects have been implemented in 17 countries, with total donations over 730 thousand euros. Over the years, more than a million visitors to the Jesolo Sand Nativity have helped revive the authentic meaning of the Christmas spirit. Macomia, Mozambique. 5,000 euros. Implementation of the “Water for Macomia: a well to give life” project, involving the excavation of an artesian well in the Macomia district. The project will provide drinking water for the local inhabitants, who currently have to travel several kilometres for supplies of this vital resource. This project is the result of collaboration between the Cavanis Institute Mission Directorate and the non-profit organization Amicizia Lontana (AL). Cartagena, Colombia. 5,000 euros. Construction of the “La Maria” Social Centre in the city of Cartagena. This facility will be used to shelter and protect young girls exposed to serious risk of violence at home or on the street. The centre will provide the girls with hot meals, literacy education, comfort and a process of integration into social life. The project is organized by the No Indifference non-profit organization..
Bissau, Guinea. 8,145.66 euros. Creation of the “Casa Verona” multi-purpose centre in Bissau, the capital city of Guinea. In particular, these funds will allow the construction of a large library annexed to the centre, as part of a complex project to promote literacy among local children and youth. This activity is coordinated by the “Bedanda Onlus” missionary group..
Associazione Volontari Ospedalieri (Association of Hospital Volunteers). 4,000 euros. A.V.O. will use these funds to purchase a scalp-cooling cap designed to prevent hair loss in patients undergoing chemotherapy, as part of the humanization of the care and alleviation of the psychological suffering connected with this therapy, which is essential for the treatment of breast cancer. Lega Italiana per la Lotta contro i Tumori (Italian League for the Fight against Cancer). 7,000 euros. L.I.L.T. also provides transport for cancer patients in conditions of economic difficulty or social exclusion and thus unable to make the journeys between their homes and the care centres. These funds will cover the fuel costs for a vehicle used for this care service. Support and relaunching action fund. 2,000 euros. A fund set up by the first Zoggia council in 2012 and still sustained by the municipality. It provides financial support to individuals and families in need in the Jesolo area. Telethon. 1,000 euros. This organization has been continuously funded since 2010 and provides support for medical research on rare genetic diseases, which are now over 6,000 in number. Constant funding is essential to make progress in the search for suitable therapies to fight these diseases.